A man was being tailgated by a stressed-out woman on a busy street, when he stopped at a yellow light, that he could have squeaked through. The tailgating woman hit the roof, and the horn, screaming in frustration as she missed her chance to get through the intersection. As she was still in mid-rant, she heard a tap on her window and looked up into the face of a very serious police officer. The officer ordered her to exit her car with her hands up. He took her to the police station where she was searched, finger-printed, photographed, and locked in a holding cell. He said, "I'm very sorry for this mistake. You see, I pulled up behind your car while you were blowing your horn, flipping off the guy in front of you, and cussing a blue streak at him. I noticed, the 'What Would Jesus Do?' decal, the 'Follow Me to Sunday-School' bumper sticker, and the Christian fish emblem on the trunk. Naturally, I assumed you had stolen the car." Unfortunately Christians are not immune from conflict. Conflict has a way of ruining our relationships and unity as the body of Christ. 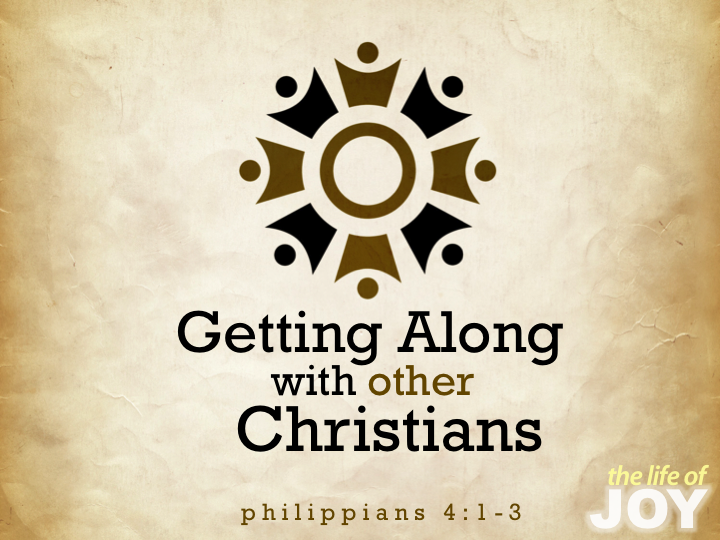 This morning we're going to see in Philippians 4, three means of restoring unity among Christians.